This green Irish soccer jersey features Ireland printed boldly across the chest. 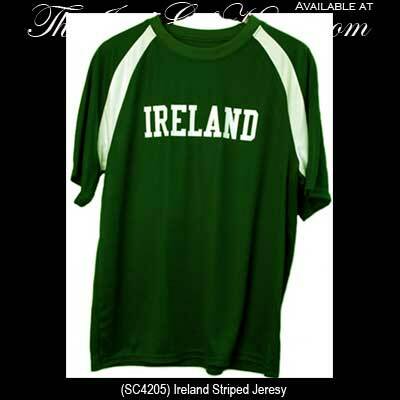 This Irish soccer jersey is enhanced with double-needle hemmed sleeves and bottom. This Irish soccer shirt is a classic style in forest green with white accenting. The athletic Irish soccer jersey features 100% polyester wicking material and breathable poly/spandex mesh inserts. Imprinted with thermo-grip film, the Ireland soccer shirt is available from The Irish Gift House in adult sizes small through XXL.